Lord Siva and Bhagavan Sri Ramana Maharshi have endowed immense blessings upon us in giving a place in Santa Cruz, California for the proliferation of the Sanatana Dharma and Advaita Vedanta. 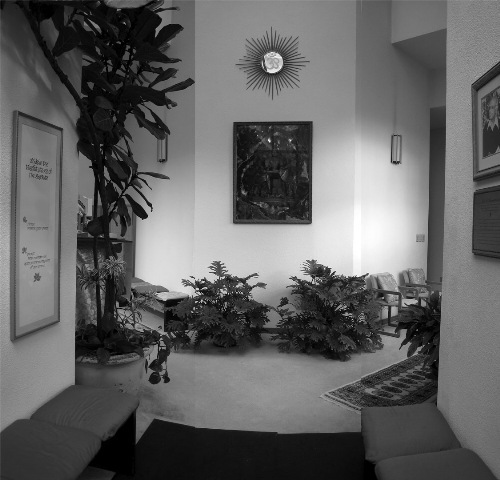 The SAT Temple opened its doors in 1989 for the sole purpose of providing an atmosphere where devotees may listen to Sri Ramana’s teaching of Self-Inquiry, reflect and meditate upon it, and directly experience the Eternal Truth of the Self. 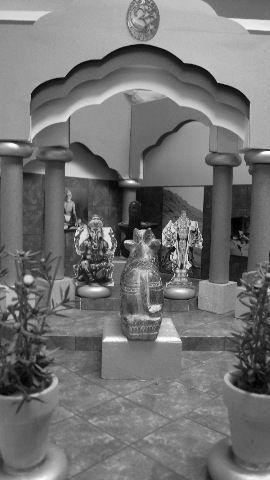 Devotees at the SAT Temple have a vision of enhancing the interior of the Temple where the front entryway is now to create a home for deities Ganesha and Subramania, reflecting the ambiance of that found in Siva temples throughout sacred India. This new addition named, “Sri Sadisvara (Lord of Being, Lord of Truth, Lord of Existence) Mandiram,” would also hold a stone Siva Lingam in its center, and a path would be formed for devotees to conduct pradakshina around the Lingam and the deities. 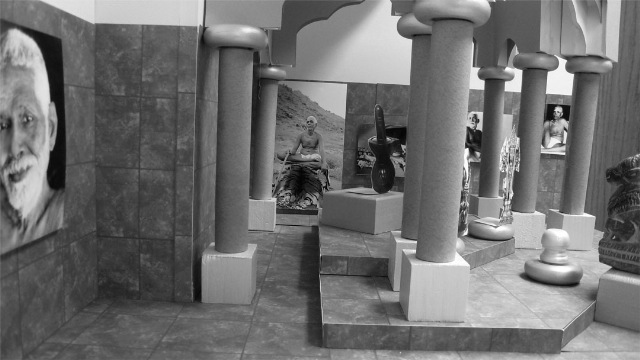 The columns would hold stone carved bas-relief tiles reflecting stories from the Puranas. 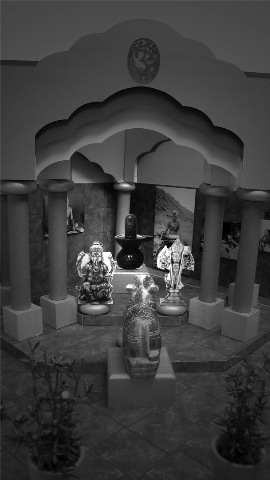 The stone walls would be adorned with images of Bhagavan Sri Ramana Maharshi, and Nandi would take his place facing the Siva Lingam. …transformed into the Sri Sadisvara Mandiram. 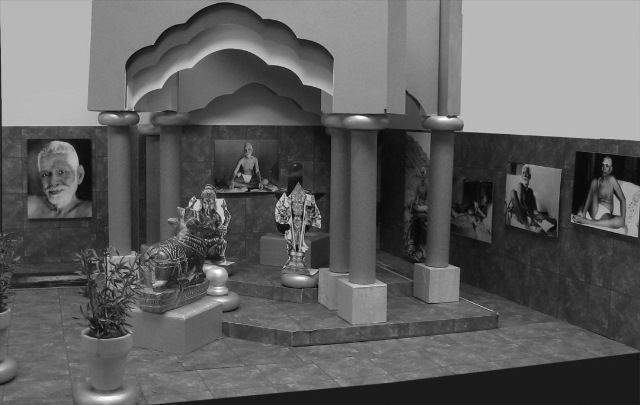 The following images represent a conceptual model of the Sri Sadisvara Mandiram. A path is formed to perform pradakshina around the deities. 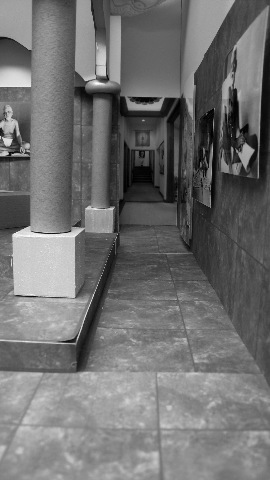 The hallway leading to the Lotus Room. Sample of the style of column depicting stories from the Puranas. 1. mail your donation to: Society of Abidance in Truth, 1834 Ocean St., Santa Cruz, CA, USA. 2. leave your donation in the “Donation Box” located in the entry of the temple. Please make your check payable to: Society of Abidance in Truth, or SAT and indicate in the memo that your donation is for the “Sri Sadisvara Mandiram” project. *SAT (Society of Abidance in Truth) is a non-profit 501(C)3 religious organization. Your contributions are tax-deductible. **If you wish to remain an anonymous sponsor, please indicate so. Posted in Advaita Vedanta, Ajata, Enlightenment, Events, Master Nome, Ribhu Gita, SAT Temple, Satsang, Self-Inquiry, Self-Knowledge, Self-Realization, Siva, Society of Abidance in Truth, Sri Ramana Maharshi, Upanishads, Who Am I?